This week I visited the newly-built and impressive-looking SAHMRI (South Australian Health and Medical Research Institute) building in Adelaide. Together with Trevor Worthy, Warren Handley and Phoebe McInerney, we used their hospital CT scanner to scan the tracheal system of a cassowary. This is in aid of Phoebe’s Honours project, which I am co-supervising. Figure 1: Trevor, Warren, Phoebe and I (and cassowary) at SAHMRI this week. We are using a technique called diceCT which stands for “Diffusible Iodine-based Contrast Enhanced Computed Tomography”. It is a relatively new technique that yields spectacular results (see Figure 2). It is mostly being used by morphologists who want better differentiation between different types of soft tissues than you normally get from a regular CT scan – the results are comparable with those you get using MRI (Magnetic Resonance Imaging). A big thank you to Mishelle! We were very excited to visit the new facility, and I look forward to seeing Phoebe’s project take shape throughout the year. Figure 2: The head of the Australian lungfish, Neoceratodus, imaged using diceCT. 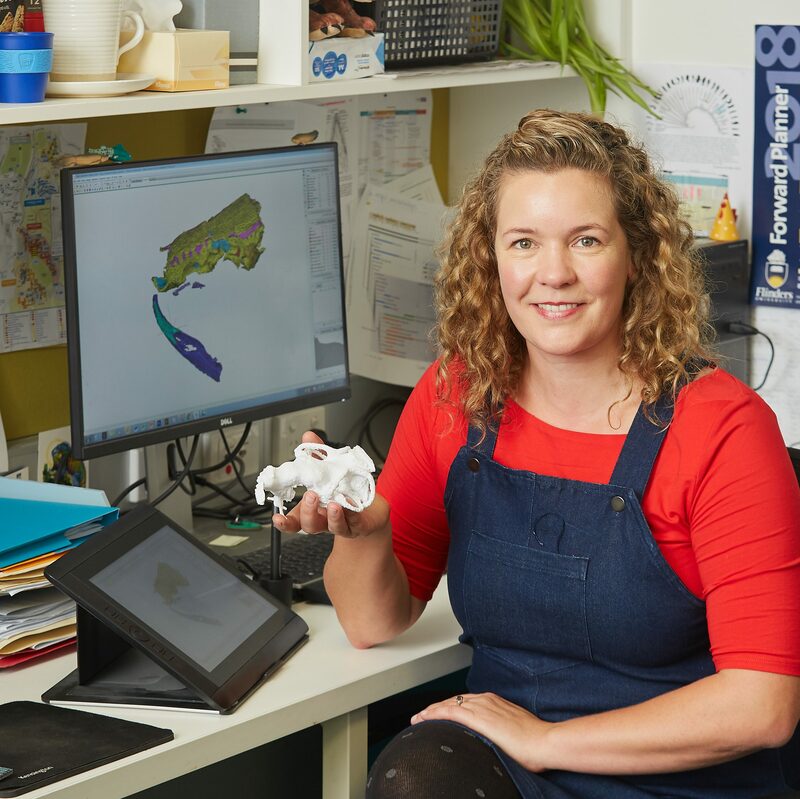 Today my profile was published on the Flinders University “Inspiring Research” in a new feature where ECR’s (Early Career Researchers) are featured so as to promote research links across the University. I was encouraged to partake after being a part of the fabulous Flinders University Researcher Mentoring Scheme last year. I strongly advice ECR’s to make the most of any mentoring opportunities available to you, whether these be official or not. These people can help you navigate the most vulnerable stage in your career and better plan for the future you want. I’ve benefited greatly from a number of mentors, some of whom where my official supervisors, but many who were not. I wouldn’t have got as far as I have today without their guidance. Last year I won one of the Vice Chancellor’s Awards for Early Career Researcher as recognition of “outstanding contribution to the University”, along with seven of my colleagues. I intend to use the cash prize to visit Dr Rob Gess, a palaeontologist from South Africa based at Rhodes University, Grahamstown. Together we will describe a new species of lungfish from the polar Famennian Waterloo Farm locality of South Africa. Needless to say, I’m very excited! Figure: Rob and friend at the Early and Lower Vertebrates Meeting in Poland, 2017. Hello all, and welcome to my new blog! Here I shall endeavour to keep you all up-to-date with my fieldwork, research, and other science adventures. And what better way to start than with a lungfish selfie!? This handsome chap, known as Neoceratodus forsteri, lives at the Melbourne Museum and I say hello to him every time I visit. The Melbourne Museum is my favourite museum in all of Australia and I can’t recommend it highly enough. My favourite galleries are “600 million years”, the “Forest Gallery” and “Wild”, but I suggest you visit yourself and make your own mind up. Tip: Look out for a primitive ray-finned fish (‘Actinopterygian‘) fossil from the world-famous Gogo Formation with “AC” written on it in black texta – I discovered this specimen during fieldwork back in 2008! (It’s in the cabinet directly opposite the living lungfish). I welcome your comments, suggestions and feedback – but please keep it respectful. Disclaimer – The views expressed on this website are my own and do not necessarily represent those of my employer.